We’ve worked with everything and tested the top heating and air conditioning brands. We offer almost any product line you may request including but not limited to Carrier, Goodman and Amana, however, our featured line we’re most proud of is Trane. 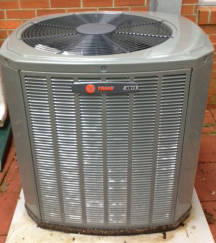 Over the years Trane has provided the reliability we require of all our units at a price you can afford. Every Trane heating and air conditioning product is designed down to every detail and rigorously tested for reliability and durability. While other manufacturers build their products from the same “pool” of parts available to anyone, Trane makes it a point to be uniquely better, innovative and always looking to the future. For 100 years Trane has offered a reliable product to it’s customers. We believe the longevity of Trane’s brand and commitment to quality reflect the craftsmanship we offer to our clients. When designing a new system we’re always sure to spec the perfect unit for your size home and financial needs. It’s for this reason our HVAC service technicians are trained to install Goodman and other air conditioning and heating systems as well. Goodman heating and air conditioning was founded in 1975 by Harold Goodman after serving the heating and A/C business as an HVAC service contractor for 21 years. The success and stability of Goodman for close to 40 years has earned its a place in the heating and air conditioning realm. Dr. Willis Carrier invented air conditioning in 1902 and became known as the “Father of Air Conditioning“. For the next 13 years Dr. Carrier installed central air units in textile factories, cotton mills, and homes around the country and then spread across the globe to Asia, Europe, the Middle East, Central and South America. It was not until 1915 Dr. Carrier was able to form Carrier Engineering Corporation with very little funds for the scope of work which would need to be done. Today Carrier remains the world leader in heating and air conditioning systems in residential and commercial applications. We’re able to offer any of the products we service, including but not limited to Carrier, Goodman and Amana heating and air conditioning units. Free estimates on installations and senior discounts where they apply. Peak Performance Heating and Air has been serving White, Lumpkin, Habersham and the surrounding counties and cities Cleveland, Helen, Sautee, Clarksville, Cornelia, etc for over 15 years. We service mobile homes, standard homes and business locations. With over 40 years of family experience in the industry, you can be assured we do the right job every time, the first time.